Spirit Nights are hosted by local restaurants and stores and give you the chance to get out of the kitchen! Print out the appropriate flyer and take it with you to the participating restaurant on the specified date. That’s it! 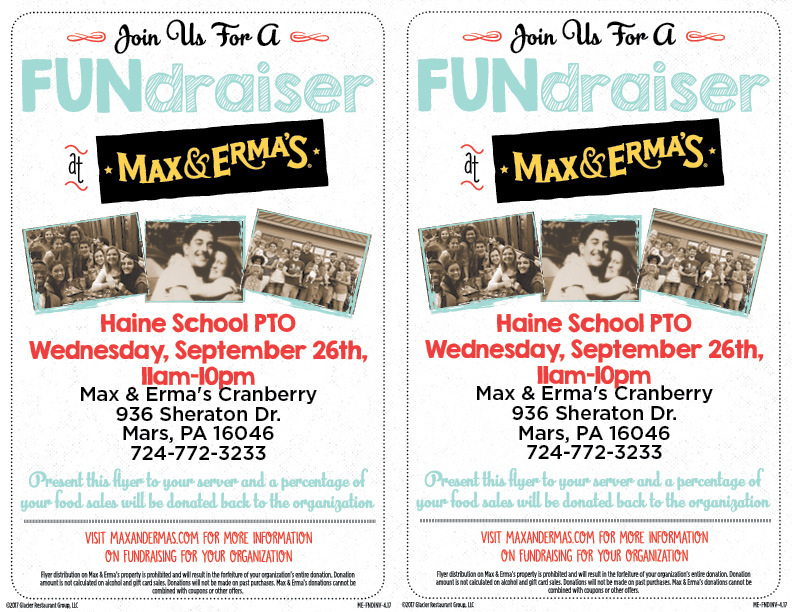 Haine PTO will automatically receive a percentage of your total bill! Applebee’s: March 21st @ 11 a.m.-9 p.m.
Max & Erma’s: September 26th @ 11 a.m.-10 p.m.
Five Guys: October 25th @ 5 p.m.- 9 p.m.
Blaze Pizza: November 28th @ 5 p.m.-8 p.m.
Chipotle: December 18th @ 4 p.m.- 8 p.m.
Max & Erma’s: January 23rd @ 11 a.m.- 10 p.m.